Nara Rohith’s ‘Prathinidhi’ has released today across the world. The movie has been promoted with good teasers and the present political situation should help matters. Let us check out the film now. Srinu ( Nara Rohith) is a man with a mission. Fed up with political corruption and other issues, he decides to kidnap the CM (Kota Srinivasarao) to make a statement. To achieve this, he uses Sreekar (Sree Vishnu),who is the son of a minister (Giribabu). Srinu cleverly comes up with a plan and finally manages to kidnap the CM. The entire country is shocked and Commissioner Posani Krishna Murali handles the communication. Srinu makes some strange demands in order to free the CM. He wants the Government to cancel 500 and 1000 rupee notes and print fresh currency devoid of current template. He also wants small change from transactions to be transferred to CM relief fund, for benefit of society. People and media make Srinu a hero but the police uncover some secrets. Is the person really Srinu or is he a Ghost? What is Sreekar’s role in the kidnap? That is the story of this movie. 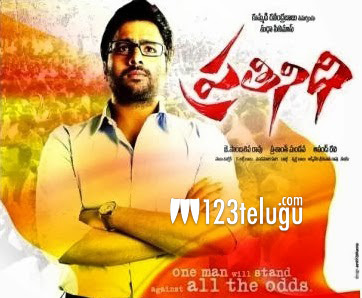 Nara Rohith gives a brilliant performance as the guy who is vexed with the system. He has displayed a lot of maturity in acting and his dialogue delivery is excellent as always. Kota Srinivasa Rao is perfect as the CM. He initially shows frustration and later compassion after learning the truth. Posani brings in much needed comedy relief as the Commissioner. Sri Vishnu is improving with every film as an actor and he has done well in this movie. Ravi Prakash is decent. Jayaprakash Reddy is routine but OK. Political scenes and interval block are very good. Some of the dialogues drew whistles and claps in the theaters. Short running time is also a big plus point. Emotional quotient has worked well in pre -climax episodes. Its not so easy to kidnap a CM who enjoys Z+ security. Perhaps, some time could have been devoted to make it more realistic. Police Department is also made to look very incapable. The only duet in the film is a nuisance and nothing more. It could have been avoided. Romantic track between hero and heroine is also boring. Shubra Ayyappa is not heroine material. At least not with this look and performance. There is no mainstream comedy or entertainment in the movie, so it may not work very well in Overseas centers. Cinematography is just about OK. Editor has done an average job. Dialogues deserve special mention as they have been written well. Prashanth Mandava’s direction is a mixed bag. He handled some scenes very well but could not sustain the tempo in other sequences. ‘Prathinidhi’ is a very promising concept but the movie ends up as just an OK film as it has been let down by a poor heroine, average execution and unnecessary scenes. The present political mood in state should ensure revenues.